Western blot analysis of extracts from Akt1 (-/-) mouse embryonic fibroblasts (MEF) or Akt2 (-/-) MEF using Akt1 (D9R8K) Rabbit mAb (upper) or Akt (pan) (C67E7) Rabbit mAb #4691 (lower). Western blot analysis of purified recombinant Akt1, Akt2, and Akt3 proteins using Akt1 (D9R8K) Rabbit mAb (upper) and Akt (pan) (C67E7) Rabbit mAb #4691 (lower). #8101 (paraffin-embedded LNCaP cell pellets, untreated (left) or LY294002-treated (right)). 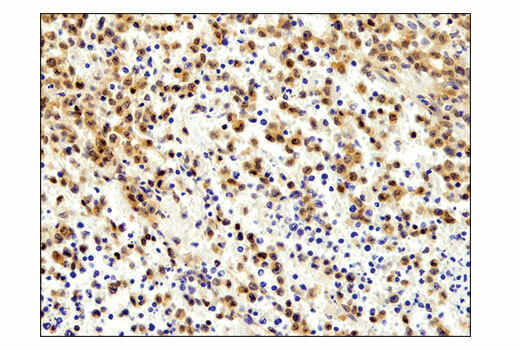 Immunohistochemical analysis of paraffin-embedded human T-cell non-Hodgkin's lymphoma using Akt1 (D9R8K) Rabbit mAb. 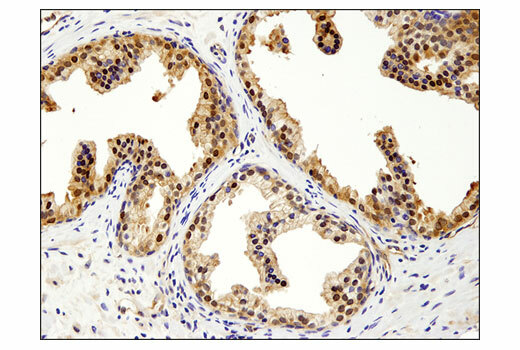 Immunohistochemical analysis of paraffin-embedded human ovarian carcinoma using Akt1 (D9R8K) Rabbit mAb. 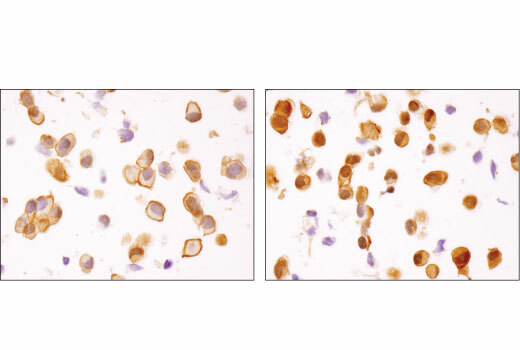 Immunohistochemical analysis of paraffin-embedded mouse embryonic fibroblast cell pellets, Akt1 wild type (left) and Akt1 (-/-) (right), using Akt1 (D9R8K) Rabbit mAb. 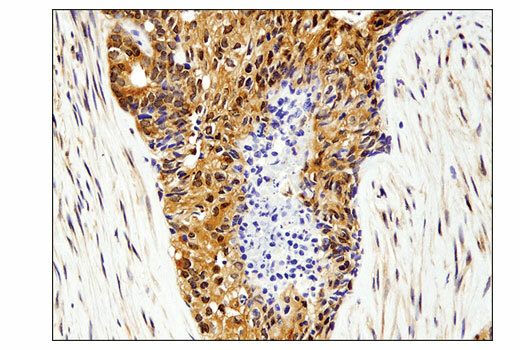 Immunohistochemical analysis of paraffin-embedded human prostate carcinoma using Akt1 (D9R8K) Rabbit mAb. 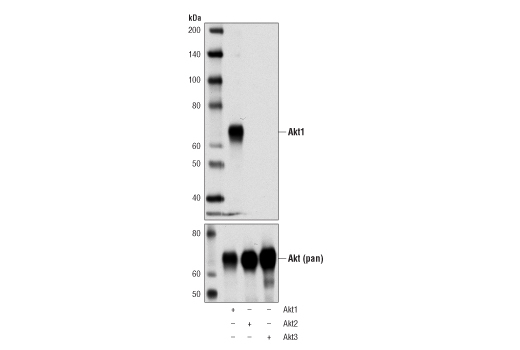 Akt1 (D9R8K) Rabbit mAb detects endogenous levels of total Akt1 protein. 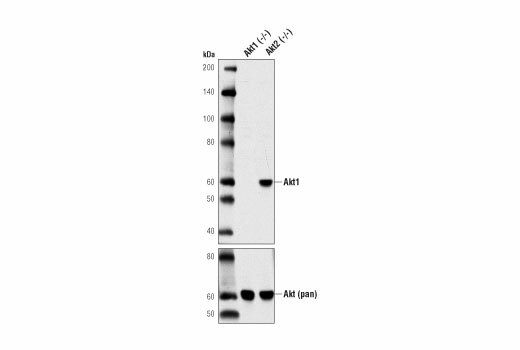 This antibody does not cross-react with Akt2 or Akt3. 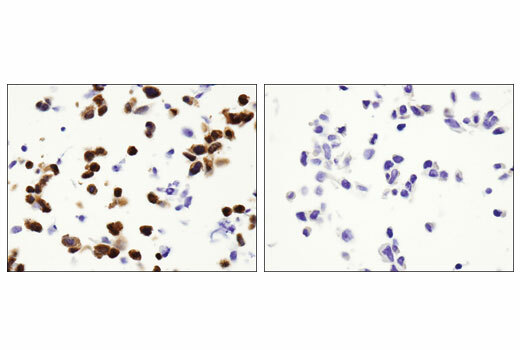 Monoclonal antibody is produced by immunizing animals with a synthetic peptide surrounding Leu110 of human Akt1. SignalSlide is a registered trademark of Cell Signaling Technology, Inc.